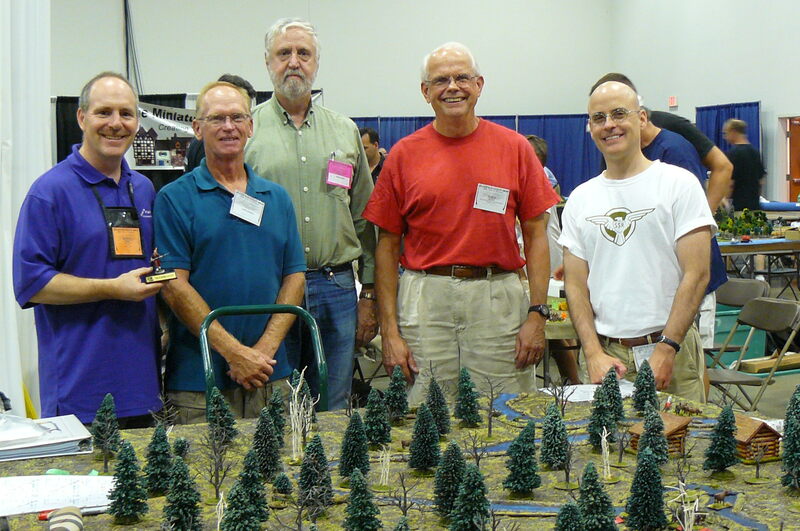 1) Red Coats and War Hawks – “The Skirmish at Nanticoke Creek”, a War of 1812 skirmish game. 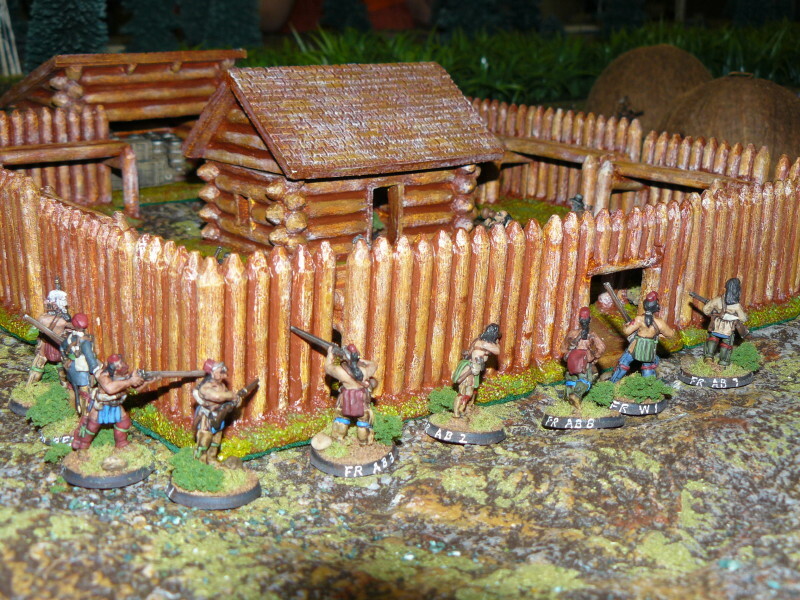 2) Buckskins and Rangers – “The Raid on Pickawillany”, a French Indian War skirmish game. These games utilized Battlefield Game Designs very own and increasingly popular rule sets – Red Coats and War Hawks for the War of 1812 scenario and Buckskins and Rangers for the French Indian War scenario as skirmish style games. Based on actual historical battles, both games played evenly and eventually went down to the wire before a victor could be determined leaving players on both sides in suspense to determine the final outcome as laid out by Game Master and Designer Robin Empey. “The Skirmish at Nanticoke Creek” was the last land battle in Upper Canada during the War of 1812 and was based on the Norfolk Militia’s attempt to thwart American Colonel Duncan McArthur and his mounted Ohio volunteers, from continuing to burn, pillage and plunder the Canadian frontier of Upper Canada all the way to Burlington Heights where the remaining British Army was encamped. Having created a “Desert Between Nations” (Upper Canada and the United States) by burning all buildings and barns from Amherstburg, near present day Windsor, as far east as the Grand River near Hamilton, McArthur’s sole purpose was to invade Upper Canada and the First Nations Territory and over-run whatever military resistance there was. In the process his army destroyed homes, mills and other life sustaining necessities leaving the local residents with nothing to eat and no where to live as the harsh winter of 1814 approached. This turned many previously indifferent local farmers and homesteaders, including ones who had made the move from the United States, against the on-coming American invaders. Captain White had ordered his Norfolk militia to round up as many of the local cattle population as they could in order to prevent them from being slaughtered and keep the local populace from starving during the winter. As they completed their mission, a small detachment of Upper Canadian militia met a small detachment of mounted American frontiersmen and the Skirmish of Nanticoke Creek transpired. “The Raid on Pickawillany” The Battle of Pickawillany, near modern-day Piqua, Ohio, was a minor yet very significant confrontation between the French, English and their Aboriginal allies in western Ohio in the years just before the outbreak of the French Indian War. Although little remembered today, it gravely foreshadowed the oncoming conflict that would ravage the North American continent for nearly a decade after. The Miami Indian Village of Pickawillany was settled at a strategic spot at the northern end of the Great Miami River. Although the French controlled the lakes, the British and their Aboriginal allies could still move goods and people by water down the Ohio River and then northwest into French territory using the Great Miami, the Wabash and the St. Mary’s Rivers. Whoever controlled this area controlled the Northwest Territory, and whoever controlled the Northwest Territory would win the rights to the territory. Pickawillany also threatened the French because it was a lure for western tribes eager to trade their furs for British goods, which were cheaper than those offered by the French. Chief La Demoiselle, nicknamed ”Old Britain” thought he had outmanoeuvred the two great European powers, of Britain and France because he had broken away from the French and welcomed the British, who sought to establish a foothold in the West. Although the British and French were eager to use the tribes for their own self interests and purposes, the Aboriginal people were just as eager to do the same with the two European powers. Finally, on the morning of June 21st, 1752, the French Métis coureur de bois Charles de Langlade led the French allied tribes of Ottawa and Ojibwa Indians in an attack on the British allied trading post and Village of Pickawillany in order to drive the British traders out of the Ohio Country and to punish Miami Chief La Demoiselle for rejecting the French alliance while dealing with the British.